Recently, I received an alarming e-mail stating that the words, “In God We Trust”, were removed from the new dollar coin. Disturbed by this, I was tempted to join the campaign to boycott the coin until one of my wise friends cautioned me to first validate the claim. So I did by inspecting the first new dollar coin received to see if the claim was true. As expected, I was disappointed to find out that our national statement of faith in God was not on the face or the back of the coin. But still finding it hard to believe, I searched the coin further. 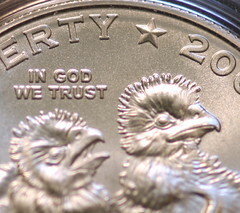 And then, there the words were…impeccably inscribed on the side rim of the coin – “IN GOD WE TRUST.” While I don’t know why the words were moved to the rim, I am glad that our new dollar coin still declares our national legacy of genuine faith in God. Unfortunately, we won’t always understand certain things in life; however, during such times we can most certainly believe the Word of the Lord as stated in Proverbs 3:5-6, “Trust in the Lord with all your heart and lean not on your own understanding. In all your ways acknowledge Him, and He shall direct your paths.” With a spirit of faith and commitment, first put your trust in God before anything else, and you will discover that He is faithful to lead you into all truth and fulfill all of His promises for your life! The Make It Happen Moment ® Trusting First Copyright 2008, The Make It Happen Learning Institute. You have permission to reprint The Make It Happen Moment ® Trusting First, in its entirety only, and forward to your colleagues and friends, provided the copyright notice remains part of the reprint and transmission. All other rights reserved.